I&apos;m floating facedown in 82-degree water, wearing swim trunks and snorkel gear, watching colorful fish I can&apos;t name and wondering when the next curious sea lion pup will come nose-to-nose with this begoggled stranger. Far above, the sky is summer blue and the air temperature is 90 degrees, although it&apos;s winter here, and the north breeze is light and refreshing. This is life inMexico&apos;s Sea of Cortez, just offshore of Los Islotes, a group of large, red rocks spectacularly sculpted by sea and wind and stained white by thousands of generations of seabirds. Dozens of California sea lions are ashore, honking, grunting, barking, creating offensive odors, and keeping a close eye on us. This delightful place is reached only by boat. Getting here, either by power or sail, can be adventuresome, exciting, sometimes frightening, and even risky, considering the vast expanse of Pacific Ocean that must be crossed. Many cruisers accept the challenge simply because the rewards are worth it. I came the easy way, via airplane to La Paz, then aboard a classic old yacht, and, finally, in an inflatable dinghy. The rewards are almost the same. Our mother ships, a pair of historically important North Sea trawlers, left La Paz this morning and now are anchored a few miles south at Isla Partida in the kind of harbor seen on covers of travel brochures. 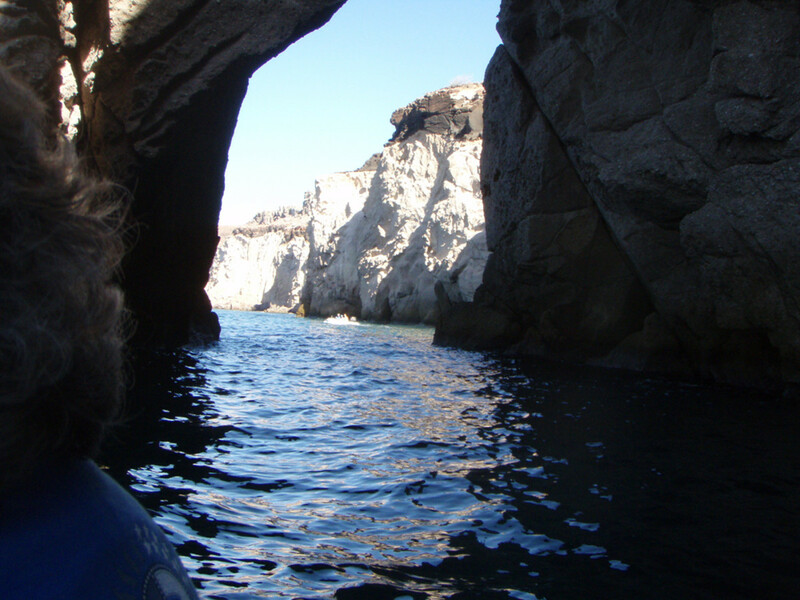 After anchoring, seven of us jumped aboard inflatables and zipped up the coastline, steering through some natural rock arches along the shore to Los Islotes and its colony of sea lions. Five of us are in the water acting like kids. Mark this spot: the center of my world at this moment is 24 degrees 36 minutes north, 110 degrees 35 minutes west. This is about 25 miles north of La Paz, on the eastern shore of Mexico&apos;s Baja California peninsula. My home is at 48 degrees north, 121 degrees west.What a difference 24 degrees makes. In only a couple of days, southern Baja has demolished notions about Mexico that lingered from my first visit 25 years ago. Then, I recall, it was an intolerably hot, dirty, and barren land where I thought it unsafe to eat, drink, or breathe deeply. As for Baja being barren land: One good hike showed me there&apos;s an amazing amount of animal and plant life to watch when you go ashore and beyond the beach. The animals may be small, but evidence of their presence is everywhere. Thorn bushes that look dead display brightly colored blossoms. Birds flutter easily among spiny branches. You do need to bring your own drinking water. Smooth, peaceful water surrounds us off Los Islotes and the only risk is sunburn, but boaters in Mexican waters need to be superbly capable of operating a selfsufficient vessel, from handling a craft in poor weather to navigating long distances with outdated and sometimes erroneous paper charts to having a keen eye for weather and-very important-having the ability to fix things. Bill and his cruising partner, Angie Alejandre, are keeping watch over our party of five snorkelers. I haven&apos;t snorkeled in decades and was having problems getting my mask and tube to fit. Bill and Angie came alongside, and he adjusted the gear perfectly. Bill lives in La Paz aboard Ocean Quest, a Romsdal built in Norway in 1960. Angie is a surgical nurse in a local hospital. His yacht is one in a two-boat team cruising among the islands north of La Paz. The second boat is Ursa Major, a 65-foot Malahide North Sea trawler built in Norway and Ireland and launched in 1972. I&apos;m a guest aboard her. Joyce Gauthier, the owner of Ursa, is snorkeling off to my left. A certified scuba diver, she&apos;s taking it easy today. Curious as a kitten, another sea lion pup zooms toward me, and I aim my digital Olympus 770 (which does work underwater, as Olympus promises) and snap a picture as it scoots by like a torpedo. I move so slowly compared to the frisky young sea lion, I know I&apos;ve missed. So I snorkel along into a huge school of fish. There are so many, I can&apos;t miss. Snap, and I have a picture. Warming up from the exertion of swimming in 82- degree water, I climb aboard Ursa Major&apos;s inflatable tender to cool off in the light breeze. What a crazy world this is. I like it. From the pilothouse of a cruising yacht, the Sea of Cortez appears boundless. It is roughly 600 miles long, stretches along a northwest-southeast axis, is about 100 miles-plus wide, and is rich in cruising opportunities and popular for diving, kayaking, fishing, and hiking. Baja California, a long, rocky spine separating the sea from the Pacific Ocean, contains two Mexican states, with Ensenada and Cabo San Lucas its two best-known ports. La Paz, far from the posh resort atmosphere at Cabo San Lucas, is a busy, seemingly prosperous town, with a shipyard, hotel, major box stores, and hospitals. It has a charming waterfront boulevard, shaded with palm trees and decorated with impressive sculptures, that stretches along a white sand beach. Find a bench above the beach and watch the panga owners negotiate fishing and sightseeing trips in their small, open boats. There are three marinas in town, and Ursa Major and Ocean Quest were in Marina de La Paz, along with dozens of other craft bearing U.S. hailing ports. Some owners come south for the winter season, and others, like Bill Lee and Ron Miller, a sea captain and cruising friend, live here on their boats year-round. Ursa Major is operated as a charter yacht in Alaska in the summer and in the Sea of Cortez in the winter. She has been in port only a few days, following the long run from Seattle, and Joyce invited friends aboard for a preseason cruise. Our goal was to motor north of La Paz among a chain of islands strung along the east shore of the peninsula. But first we needed dinner and groceries for the week. Bill led us to a small restaurant near the marina, where we loaded tortillas with carne asada (bite-size pieces of marinated beef cooked outdoors) and with onions, tomatoes, salsa, cucumbers, and other good things I didn&apos;t recognize. A Pacifico cerveza was just right. At City Club, which looks and works like a Costco store, we spent thousands of pesos on food, but in Yankee terms it came to about $400. Most impressive were the huge mesh bags of limes and avocados we carried from the store. Emily Waschak, who holds a master&apos;s degree in fisheries biology and usually works as kayak master and naturalist on Ursa, was doubling on this trip as deckhand and chef (and she made the best guacamole I&apos;ve ever tasted). As we lined up a string of marina dock carts to haul the groceries to the boat, I thought about our destination for the next day: either Isla Partida or its close neighbor, Isla Espiritu Santo. Ursa&apos;s crew and guidebooks promised several good anchorages, sweeping, sandy beaches, and a tumbled, colorful array of striated rock, the result of tectonic plate shifting and eons of weathering and volcanic activity. The islands are 20-plus miles north of La Paz, about three hours running at displacement speeds. Isla Espiritu Santo is the first in a chain of widely scattered islands leading toward the town of Loreto, about 120 miles north of La Paz. Cruisers and sailors push beyond to Punta Concepcion and other small islands and anchorages in Bahia Concepcion. For many, Santa RosalÃ­a, about halfway up the Baja coast, is the end of the line. It also is a jumping-off point for boaters making the long crossing of the Sea of Cortez to San Carlos or Guaymas on the Mexican mainland. Because our time was limited, we would cruise only to Isla San Francisco, 44 nautical miles north of La Paz. That was the plan. But we didn&apos;t get there. Next morning, both trawlers were getting ready to leave port. Engines were warming and gear was being stowed. On Ocean Quest, Bill followed his usual departure checklist and tested gears. The big yacht moved gently astern against her mooring lines as he engaged the variable-pitch propeller. He moved the controller to forward-and nothing happened. Although the hydraulic controller had been removed and rebuilt during the restoration, Bill suspected it was the problem. The device, in the bilge beneath the master stateroom, weighs an estimated 200 lb. Bill knew the system well, but he needed assistance. In a response typical of the cruising community, Josh Haury, skipper of Ursa Major, went to help. He was joined by a temporary Ursa crew member, John Love, a U.S. Ski Team hopeful and a licensed skipper who operates a family-owned charter yacht on Alaska&apos;s Prince William Sound in the summer. They removed the controller and hauled it up a steep stairway to the main deck, then out to the mooring float. The problem, apparently a stuck piston, was corrected, and the heavy chunk of steel was carried back aboard and installed. It worked. The job sounds simple, but it took about 12 hours, start to finish. Although La Paz has a boatyard and engine technicians, I doubt Bill would have found anyone in town who shares his knowledge of the complex, variable-pitch European-built propeller and controller, both original equipment and nearly a half century old. Self-sufficiency is the most valuable thing a boater can take cruising. We were ready to pull our mooring lines aboard the next morning and head north. But first we had to check the weather. When I cruise the Inside Passage, my morning ritual seldom changes. First, switch on the VHF radio and dial in the appropriate channel for weather forecasts and conditions (NOAA in the United States; Environment Canada in British Columbia). Next, start heating water for coffee and, if in port, click on the ship&apos;s computer to compare online weather forecasts. The coffee ritual is not threatened in the Sea of Cortez, but there is nobody talking on what we know as weather channels. There are no government forecasts or condition reports available to recreational boaters. At home, we also appreciate the presence of Coast Guard stations in the U.S. and Canada and their round-theclock response to emergencies on VHF 16. That won&apos;t be found in Mexican waters, either. Help, if needed, comes from fellow boaters, fishermen, and, occasionally, the Mexican navy, I&apos;m told. The basics for weather forecasting are available in La Paz marinas with Internet connections. U.S.-based online sources of weather forecasts and conditions for the Sea of Cortez include Weather Underground (www.wunderground.com), www.buoyweather.com, and www.intellicast.com. Summing up: the weather looked good for several days out, although northerly winds were forecast for later in the week. With skippers Josh and Bill satisfied by the predictions, the big trawlers motored out of the marina. Ocean Quest, her drive system working perfectly, led the way along the narrow, well-marked navigation channel fronting La Paz. Cruising was easy in a smooth sea. Soon, Punta la Dispensa, a rocky bluff on the southwest tip of Isla Espiritu Santo, rose above the starboard bow. A group of U.S. and Mexican conservation groups works with the Mexican government to preserve and protect the Isla Espiritu Santo chain of islands and its rich population of marine life. The Nature Conservancy describes the Sea of Cortez as the second most diverse marine body in the world, reporting it is home to 31 species of whales and dolphins and the breeding ground for sea lions and marine turtles. Hundreds of species of migratory birds visit the islands, and thousands of species of fish and other marine life are in its waters. We found a far different sea creature about midway up the coast of Isla Espiritu Santo. Anchored in the lee of tiny Isla Ballena was the 289-foot Maltese Falcon, a spectacular three-masted sailing yacht. Launched in Italy in 2006, she has carbon-fiber masts and yards, and her sails are computer controlled and electrically powered. For a while recently, she was for sale at a price of $237 million. Maltese Falcon was in sight for several days. We were disappointed she did not raise her sails, but some of the Ursa Major crew on an inspection trip by dinghy were rewarded by watching the sailing vessel launch a small submersible. At night, bright lights illuminated her masts and yards. I couldn&apos;t decide if she resembled a forest of Christmas trees or a lighted big-city boulevard. We anchored in Ensenada Grande on the west shore of Isla Partida. Northerlies began blowing that afternoon and continued overnight. The heavy trawlers rolled in the wind, and both boats moved the next morning to better shelter in the same harbor. The opportunity, however, was not wasted. We snorkeled, swam, and sailed a 14-foot Laser that Ursa Major carries aboard. I learned how to drive a WaveRunner, among Ocean Quest&apos;s collection of boat toys. I was conservative, managing straight lines and gentle turns, and was amazed at how others made the lively little water jet dance and spin. Early one evening, Josh, Emily, and I ventured out aboard the yacht&apos;s inflatable tender to look for bluefooted boobies in La Cueva, a small neighboring harbor. Frankly, I was skeptical such a bird existed. Was Josh just taking us for a ride? But he&apos;s a straight shooter. We approached a vertical rock cliff rising from the water and spotted half a dozen seabirds perched on ledges. As we closed on their perch, several flew away, and, yes, they had blue feet. Leaving the birds, we beached the dinghy and climbed to the top of the ridge separating La Cueva from our anchorage in Ensenada Grande. The hill was a mixture of black volcanic rock and a pinkish sedimentary rock containing a blend of small stones, sand, grit, fossilized shells, and other sharp debris. It offered a sure grip for my hiking shoes, but I cringed thinking about the damage to knees or rear if I took a spill. The anchorage was serene, but the open sea was white with breaking waves all the way to the horizon. The dinghy bounced through some rough stuff on the way back to the trawler, making me wonder if we would spend yet another day in this beautiful anchorage. We stayed three nights, with winds of 30 knots blowing across the open channel and seas of 5/6 feet pounding tight together ahead of the wind. Also at anchor in Ensenada Grande was Om Shanti, a 32-foot cutter-rigged Westsail. Her owners, Shawn Breeding and Heather Bansmer, have been cruising the Sea of Cortez since late 2003 and are friends of the owners and crew of the two big trawlers. They also are the authors, photographers, artists, and editors of the newest Baja cruising guide, Sea of Cortez: A Cruiser&apos;s Guidebook. They did everything for the guide but run the printing press. Knowing official charts are not reliable, Shawn and Heather took countless depth and GPS readings at major points of land and in all anchorages in the Sea of Cortez, prepared tables of waypoints, and drafted chartlets of those anchorages. Other guidebooks offer similar small charts, and The Moorings, which has a bareboat charter business in La Paz, produces charts for its clients. Aboard Ursa, Josh showed me pencil charts he has made of the anchorages he visits with charter clients. Douglass, Hemingway & Co. publishes a useful map that covers the east and west coasts of Baja. It can&apos;t be used for navigation, but it&apos;s an excellent source of information for planning cruises. Another guidebook I like is MexicoBoating Guide by Capt. Pat Rains. She and her husband, John, are veteran Mexico cruising hands. Baja California & Los Cabos by Danny Palmerlee is not a cruising guide, but it provides an excellent review of facilities available in Baja communities and recommends places to visit, fish, and dive. Shawn and Heather, who live and work in Blaine, Washington, during the off season to rebuild their cruising kitty, joined the crews of the two big boats for a dinner of fried dorado one evening. Many stories were told, and I learned a lot about boating in the Sea of Cortez. After dark, Bill provided entertainment by switching on Ocean Quest&apos;s underwater lights. Hundreds of small fish soon appeared and shimmied in the glow. In a while, larger fish arrived to dine, and they were followed by manta rays and sea lions-all hungry, too. Saturday morning, our next-to-last day, we decided to go for it: to turn north to Isla San Francisco. Ursa Major moved out while Ocean Quest hoisted her anchor. I joined the Romsdal crew for my first cruise aboard her. The Malahide was about a half mile ahead and, as she cleared the protected anchorage, we could see her bow begin to rise and fall. She continued to punch northward, and the hobbyhorse motion worsened. Bill and I watched; he instructed John Love, who was at the wheel, to turn south. Seconds later, Ursa Major reversed her course. Cruising became much calmer with the wind and seas behind us. Relaxing, I began to make notes about the powerboats we had seen, and the list seemed to show that size and nameplate are less important than the condition of the craft and the skills of the crew. While there were some huge power yachts in La Paz&apos;s Marina CostaBaja-a luxurious new marine resort-I found regular boats, as well. Among them in my memory are a Willard 40 pilothouse; a 54 Krogen and a 53 Selene; a pair of CHB-type yachts, both 40 feet or less; a Santa Barbara; a 46-foot wood boat my friend Ron Miller cruised in from Friday Harbor, Washington; and a new 42 Nordic Tug. There were many others, often seen at a distance, and plenty of sailing craft. But the anchorages never were crowded. From the helm of Ocean Quest, I looked toward shore to a tidy row of white tents on the beach and a cluster of kayaks pulled up on the sand. They were part of a guided kayak tour. It looked like a good way to see the islands. In late 2007 I joined the final legs of the FUBAR rally, a flotilla of about 50 powerboats (the smallest of which was 30 feet) that cruised from San Diego to La Paz. The second FUBAR rally is scheduled for this November, and if the sign-up list hasn&apos;t closed, it would be a great way to make a first trip to Mexico. Sailors hold similar cruising rallies; the 2008 Baja Ha- Ha, with about 180 boats, was winding up in Cabo San Lucas as we ended our island-hopping adventure. Some of the sailors were expected to move into the Sea of Cortez for a winter of cruising. Our skippers took us into Bahia San Gabriel, near the south tip of Isla Espiritu Santo, and Ocean Quest dumped her anchor and Ursa Major came alongside. Ursa is a big boat-more than 100 tons-and she has only a single engine. Bringing her within touching distance of another large, floating target that&apos;s moving with wind and current takes real talent. And Josh has it. The maneuver looked easy. To celebrate our last full day at sea, four of us filled the 8-foot inflatable from Ocean Quest and headed for shore. Bill and Angie went beachcombing, and John and I hiked 2-plus miles across a low section of the island to the east shore and Playa Bonanza, a curving, white sand beach that sweeps between rocky points a couple of miles apart. The low area, or arroyo, looked like a desert from a distance, except for a few scattered splashes of green, and I expected to find a dead zone there. The arroyo was laced with shallow, dry stream channels that fill when rain falls over the adjoining hills, refreshing the desert floor and bringing plants to life. It was not dead. Piles of dirt surrounding small holes suggested burrowing critters. Heaps of brown pellets were proof of rabbits, and I saw one fleeing as we neared. Every flower bud and leaf was surrounded by sharp spines, and I wondered how rabbits manage to grab a bite. Birds fluttered among the thorny bushes, and lizards scrambled from the sound of our marching feet. With rabbits to spare, there had to be predators somewhere. But we saw none. We did see hoof prints, but not the goats or sheep that had left them. Many spiny plants seemed dead, their branches gray and brittle. But occasionally we saw yellow and red blossoms on those "dead" plants and looked closely to see tight, little green leaf buds waiting for moisture. Brer Rabbit would have been at home in the dense clusters of spiny bushes, but John and I had to tack to find a clear path. Even so, we ended the trip with spines through the soles of our shoes and our legs scratched by thorny seedpods. The sea was refreshing when we finally struggled through the last of the spiny brush. There were a few footsteps in the sand, and there was a small boat on the shore a mile away. At water&apos;s edge the sand was loose, almost liquid, and if I stood still I could feel it creeping over my ankles. Playa Bonanza was worth the effort. John and I were alone on a beautiful beach. In the United States, a similar beach would be crowded, but traffic seems light on the beaches of Baja. The round-trip took nearly three hours and a liter of water each. Back aboard Ursa, we both jumped in the bay. Most of us don&apos;t have the time, the boat, or the inclination to make the long ocean voyage to Mexico and the Sea of Cortez. There are other ways to do it. Try a kayak tour blended with whale watching. The Internet is jammed with kayak tour vendors in the Sea of Cortez. Some include nights ashore, camping on sandy beaches, and boarding excursion boats to look for whales. There are yacht charters such as those offered by Ursa Major (www.myursamajor.com) in the winter and spring before she heads to Alaska. She&apos;s a great old yacht with an attentive, informed crew. She carries six guests in comfort. Another yacht charterer I know, Northwest Explorations (www.nwexplorations.com), provides similar service on the 78-foot Northern Song in the Sea of Cortez and Alaska with space for 10 passengers. The owner, Brian Pemberton, is famous for his Mother Goose fleet cruises in Southeast Alaska every summer. A quick Internet survey shows many other charter providers, from vessels carrying 20 or more passengers to huge liners with thousands aboard. The Moorings in La Paz offers 37- and 47-foot power catamarans, as well as sailboats, for bareboat charter. We saw a 47 with two couples aboard in one of our anchorages. However you get here, you gotta get wet, swim with the fish, explore sandy beaches, soak up vitamin D, and follow trails into the hills. There&apos;s no better place for a warm-weather break in the winter.